Heading into the final game of the preseason, rookie pass-catcher Robert Davis is locked in a tight battle with Brian Quick for the final receiver’s spot on the roster. 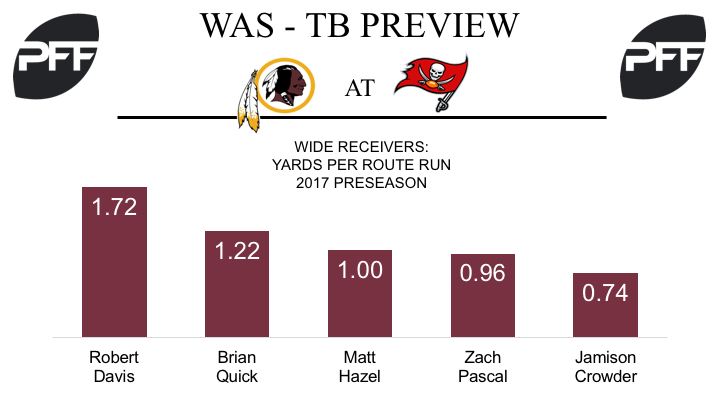 For the most part, Davis has outplayed Quick, and after three preseason games, Davis’ PFF overall grade of 70.7 is the highest grade among Redskins receivers, and is way ahead of Quick’s grade of 46.6. Davis has caught all five of his catchable targets and leads Washington’s receiving corps with an average of 1.72 yards per pass route run. Prior to the preseason, reports circled that Quick would need a strong campaign if he was to make the roster, and his performances to date have not done him any favors. Quick has registered ‘poor’ game grades of 53.3, 49.9 and 44.6 in his three games, and has dropped one of his six catchable targets. Despite his poor grades, he ranks second among Redskins wide receivers with an average 1.22 yards per route run. Nate Sudfeld, QB – At the close of the preseason, the Redskins coaching staff will have to decide how many quarterbacks they want to carry over to the 53-man roster, and Sudfeld will have to show a marked improvement to warrant a roster spot. Through three weeks, he’s posted the second lowest adjusted completion percentage (52.4 percent) among quarterbacks and produced a passer rating of just 51.5 on throws from a clean pocket. His PFF overall grade of 44.3 ranks 106th of 112 quarterbacks who have played this preseason. Joshua Holsey, CB – Holsey’s best performance in a Redskins uniform came last week against the Bengals, where he ended the game with a PFF overall grade of 72.8. He was targeted once in coverage, didn’t give up a reception, and provided both a stop and a sack from a corner-blitz. Despite solid play against the Bengals, Holsey could fall victim to his previous performances, where he yielded a passer rating of 106.2 on throws into his primary coverage, and failed to attain a coverage grade above 44.3. Joey Mbu, DT – With Phil Taylor set to miss the 2017 season with a quad injury, a spot has opened up in the middle of Washington’s three-man front. Joey Mbu worked with the starting unit throughout training camp, so if he can put in a strong performance he’ll be in with a chance of claiming the role. This preseason, Joey Mbu has been solid against the run, and accounted for four tackles and three stops on his 32 run defense snaps, while also tallying two pressures on his 27 pass-rushing snaps. 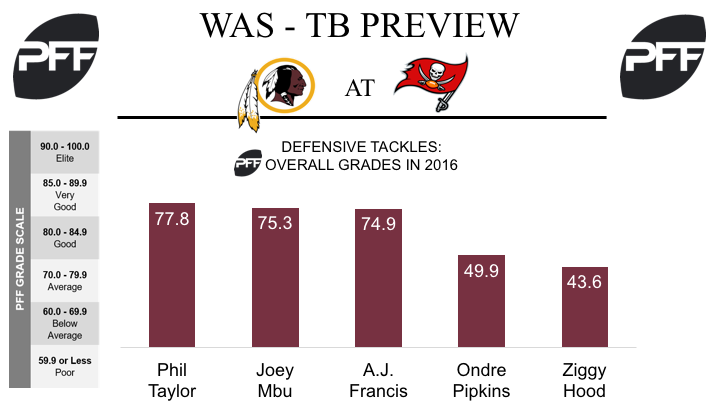 His PFF overall grade of 75.3 lies just behind Taylor’s grade of 77.8, and ranks second among Washington’s defensive tackles. Jacquizz Rodgers- Rodgers earned the start last week in the “dress rehearsal” against the Cleveland Browns and would figure to be the week one starter given his performance. Entering his seventh season, Rodgers played well last week earning an elusive rating of 54.5 while forcing three total missed tackles. Sims’ role on the Bucs has been fairly solidified all preseason as he has seemed like the favorite for passing game work since the start of training camp. In last week’s game, Sims saw time with the starters on the first drive of the game and ended up playing 11 snaps (all on passing plays). 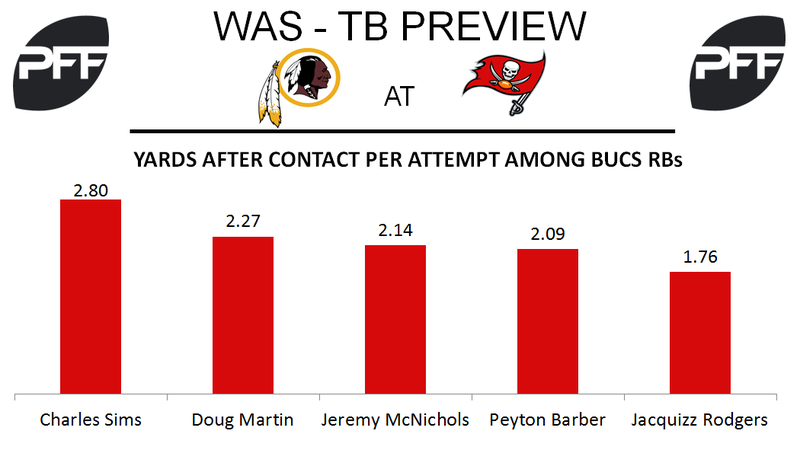 Barber came into last week’s matchup after posting the highest Week 2 overall grade among Bucs running backs, but took a bit of a step back registering a grade of 46.4 in the match up against the Browns. After drawing praise as a potential three-down back, McNichols has struggled a bit so far this preseason. His play hit a new low last week as he was only on the field for two snaps and is reportedly getting one final chance to make the 53-man roster. Bernard Reedy, WR- Reedy spent time on the Bucs practice squad last season after being one of the final cuts during the 2016 preseason and figures to be in a similar spot this year. So far in 2017, the former UDFA has earned the second-highest grade of any Bucs’ offensive player and has posted a wide receiver rating of 111.8, which is the highest on the Bucs (minimum five targets). Kendell Beckwith, LB- Beckwith ran with the starters last week against the Browns and played a total of 43 snaps. His playing time is something to monitor to see if he has solidified a spot in the starting lineup or if the Bucs want to see Beckwith in one more game before making him a starter or not.